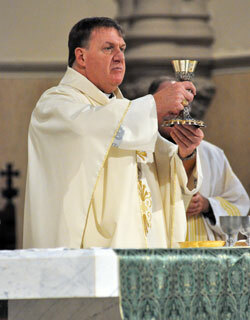 During the 34 years of his ordained ministry before being appointed the new shepherd of the Church in central and southern Indiana, Archbishop Joseph W. Tobin ministered in a broad variety of cultural contexts. He served in multicultural parishes in Detroit and Chicago and then in leadership positions among his Redemptorist religious order that ministers in 78 countries around the world. For the past two years, he helped lead the Vatican congregation that oversees the life and ministry of more than 1 million men and women religious around the world. Archbishop Tobin brings this wealth of pastoral experience to his ministry as the leader of the Archdiocese of Indianapolis, which he will begin after his Dec. 3 installation Mass at SS. Peter and Paul Cathedral in Indianapolis. In an Oct. 17 interview with The Criterion, Archbishop Tobin reflected on how his experiences will aid him in his ministry in central and southern Indiana. Q. For the past two years, you served in the Vatican as secretary for the Congregation for Institutes of Consecrated Life and Societies of Apostolic Life. How do you think that your experience of being in dialogue with men and women religious in a wide variety of communities, and in a wide variety of settings, will benefit you in your ministry as the shepherd of the Church in central and southern Indiana? A. “It’s made me value listening even more. I think that I’ll need to do that here in southern and central Indiana. “I think, too, it keeps you from generalizing. The image that I often use for religious life today is a tropical rain forest. A tropical rain forest is very bio-diverse. That’s one of the things that keeps it healthy. It has a variety of species. Some species are new and fresh and need care. Other ones are fairly strong. Other ones are elderly and need another kind of care. But it’s in their unity that they provide oxygen and allow the world to breathe. “All I’ve heard about the Archdiocese of Indianapolis are such wonderful accolades. And I’m sure they’re true. But I’m sure there are challenges as well. These statistics about the unchurched that I’ve been looking over are certainly something that should keep a bishop awake at night. Q. Before you ministered in Rome, you served for 11 years at Most Holy Redeemer Parish in Detroit, then for a year at a parish in Chicago. Both were multicultural parishes with a good-sized population of Hispanic Catholics. With your experience of ministering in so many cultural contexts, how are you looking forward to leading the Church here in the archdiocese with its historic ethnic roots and communities of new immigrants? A. “I think that the ethnic diversity of the archdiocese can be a source of strength. And even in a more theological sense, I think it is an opportunity to prolong the double miracle of Pentecost. “The first miracle was obviously that everyone hears the Good News. But, to me, the second miracle is more subtle but nonetheless real. And it’s one that continues to drive the Church through the Acts of the Apostles. “In the account of Pentecost, it does not say that the Parthians, Medes, Elamites, Mesopotamians and visitors from Rome all became sort of a great porridge after [receiving the Gospel]. “They remained Parthians, Medes, Elamites and everything else. But they found a principle of unity that did not negate their culture in essential ways, but allowed them to be part of a religious community that accepted their way of being and invited them to accept others. “Now, I’m not Pollyannaish. And I note that the first problems in the Church were cultural. It was at first the Greek speakers and the Hebrew speakers. And then the one that really threatened to end the Church at the very beginning was the question of the Jews and the Gentiles. “As seriously as Acts presents those problems, it always gives me the sensation that the people said, ‘These are real problems. But we can’t let them stop us because of the gift we’ve been given.’ And the gift was the Holy Spirit. Q. The announcement of your appointment here is being made while the Synods of Bishops is going on. It’s discussing the new evangelization. You’ve participated in many synods and ministered in many places around the world. How might this experience help Catholics here make the new evangelization a real, conscious and effective part of their daily life? A. “We need to look at not simply having a parade of “isms” when we talk about the world today—secularism, relativism, individualism, materialism—even though each of those presents a serious threat to the Christian vocation, to living as a disciple of Jesus. “But because they’ve captured the hearts of people, each of them might also contain some elements to which the Church can speak. “Another thing to consider is the situation in Europe, which, in some ways, presents different and more serious challenges than here in the United States. I’ve been thinking a lot about Paul’s entrance into Europe, which was at Philippi. “And so, to my mind, not every defeat is a failure. The defeat might be God nudging you toward the door where he really wants you to enter. Q. You’ve visited various parts of the world where the Church as an institution and in the lives of individual Catholics has a vibrant voice in society. We’re living in a place where proponents of secularism have a growing voice. Are there things that you’ve learned from these other countries where secularism doesn’t play as much of a role that we can learn from here, and help us to have a more vibrant voice in society—at a personal level and in talking about public policy and laws? A. “To me, it’s fairly clear. The Church has a right to its voice in the public square. I think it’s an insult to democracy to say that we have to exclude this [religion] or privatize it because our democratic square is not big enough to listen to that voice. “I think that the Church consciously or unconsciously can lose its place because it sold its birthright by adopting a lifestyle within the Church that was so clearly anti-evangelical that it discredited the Gospel. “A history professor of mine used to talk about how the most secularized part of North America was probably Quebec, which once was the most Catholic part. He offered a fairly compelling argument that the real secularization of Quebec began … with revelations of how wealthy the Church and religious orders were. “I think that when people who traditionally lived so poorly in Quebec realized that, it was a compelling argument not to listen to the Church. Q. What will you be doing between now and your installation Mass on Dec. 3 to prepare for your ministry here? What do you expect to do in your first year as archbishop to familiarize yourself with the Church here in central and southern Indiana? A. “I’ll go back to Rome and will no longer function as the secretary of the congregation. But I think that I’ll need to do a few things to help prepare as orderly a transition as possible. “And then I have to kind of dismantle my life, which, on the one hand is [fairly simple]. But there are other things that I have to take care of—friends that you have to say goodbye to. And that’s not always easy. I’d also like somewhere in November to make a retreat. “Obviously, I’ll do what I have to do. But what I really want to do is learn. I want to learn about the interior workings of the Catholic Center and the people here. I want to begin to learn about the clergy and the religious. “And in a personal sense, I’d like, as much as possible, to develop the beginnings of a healthy life here. And a healthy life for me means when each day am I going to have time to pray in silence? When will I have time to study? I think one of the hard things is that if you get too busy, you really have nothing more to say to people because you haven’t studied, you haven’t thought. “I want to be patient. I’m not going to learn [about] 39 counties overnight or in six months. Q. Do you hope to go out to a lot of parishes? A. “Absolutely. Absolutely. And I find that really life-giving, too. It always strikes me in Paul’s letters how often either at the beginning or at the end of the letter he thanks the people for their faith. “He praises God that they’re saints or they’re on their way or that they’ve welcomed the Gospel. I’ve got to believe that part of that gratitude came from him realizing how their faith strengthened his faith.